Acid Metal for the Wild Ones, inspired by Tank, Venom, W.A.S.P. and Diamond Head. Sabïre is Rock `n’ Roll. Sabïre is Acid Metal. Acid Metal is the sound of true resistance. Vinyl version of the debut mini album Gates Ajar to be released by No Remorse Records on May 3, 2019. Sabïre's inception occurred in December 2010 in Canada by Scarlett Monastyrski. Scarlett’s vision was to create a band where the music played was only what came out naturally when picking up an instrument, without the constraints of genre. It would be a project and sound all his own, deeply personal right down to the name itself. Musical influences for the band were Tank, Venom, W.A.S.P. and Diamond Head, with writing influences ranging from Lemmy to Loreena McKennit and beyond. Songs were written throughout 2011 and by spring 2012 some demos were recorded. But Sabïre was put temporarily on hold, and Scarlett relocated to Sydney, Australia. The vision was taking shape over the years. By August 2017 the first songs were finished and Scarlett had begun building his studio, Forgotten Earth. Throughout 2018, "Gates Ajar" was tracked, mixed and mastered by Scarlett at Forgotten Earth. Sabïre is Rock `n’ Roll. 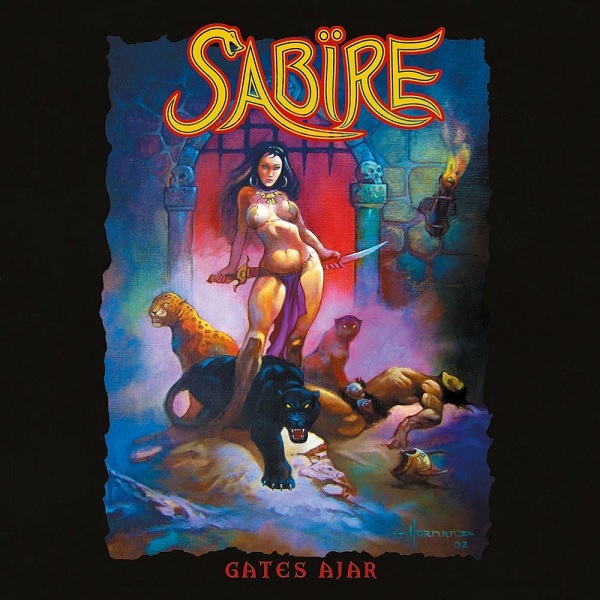 Sabïre is Acid Metal. Acid metal has nothing to do with LSD whatsoever. Acid metal takes its name from the corrosive substance. It all has to do with the sound of the guitars and the wet production overall. The guitar’s tone sounds like a drop of acid in the dark. Acidic tone. Sabïre’s lyrics no matter the subject, and they are numerous, always have a tinge of biting realism that burns like a drop of acid onto your skin. ACID METAL IS THE SOUND OF TRUE RESISTANCE. This Mini-Album is meant and intended to be a "showcase" of what can be expected in future material. Sabïre is not and will never be a single dimension art experience. Sabïre has many facets, and will in future display more of and less of each facet, as well as emerge with new angles unknown to the author at the time of this writing. "Gates Ajar" is an attempt to give the listener an idea of what is to come. Each song explores a very different facet than the last, and is sewn together as harmoniously as possible. Sabïre will perform at KEEP IT TRUE Festival (26 + 27 April 2019) and few copies of the vinyl version will be available exclusively at the festival, prior to the release date!